The comfort of hospice care means more than medical treatment. It means giving compassion, listening and support to patients and their families. It means guiding them toward resolution and creating more precious time for love. Christy Pompey followed her heart to Suncoast Hospice almost 12 years ago. 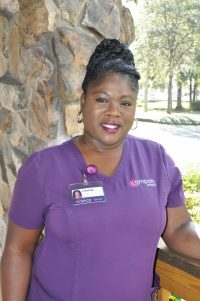 In her previous work in nursing homes as a home health aide, she learned the purpose of hospice from a former coworker who joined our organization as well as from other staff. She started as a home health aide here and later completed a work-based educational program to become an LPN (Licensed Practical Nurse). She’s now a staff LPN on our crisis care team. “In a regular nursing home environment you don’t really have that time for one-on-one care or to just sit and talk with a patient. 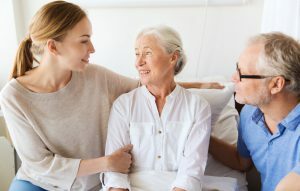 A lot of patients in facilities don’t have local family and the relationships you have with them are all they have, and they look forward to that. Initially I wanted to be a lawyer but when I found out what hospice did I could see myself doing it. When a lot of people hear end of life, they’re scared. If I can help someone be more comfortable and at peace and give that person’s family peace of mind, I feel I’ve done my job,” Pompey shared. Many patients and families come to us in states of discomfort and disarray as they cope with the end of an illness. Pompey and her team work on plans of care that help ease patients’ pain and distress. “Our LPNs take care of patients based on whatever their needs. We follow care plans that are determined by our team RNs. We may provide symptom management that addresses any pain or symptoms they’re experiencing,” she said. Supporting families is another essential part of her care. “It’s one big circle and we’re there for everybody. A lot of times there may be emotional issues with patients and families. When we’re there, that gives a spouse, child, sibling or others in the family time to step away and be the family and not the caregivers. It allows for more quality time with their loved ones and time to grieve. And for those who aren’t local, sometimes we can call and they feel they have a support system because we’re keeping in touch and giving a listening ear,” Pompey explained. Pompey and her team provide specialized support to veterans facing unique challenges related to their health and service. “We see a lot of veterans with lung issues, hand injuries, burns and amputations and some with mental issues as well. Oftentimes with WWII veterans we see pictures, medals and flags around their homes and their expressions of pride. While many times, we don’t know Vietnam veterans are veterans because of how they were treated when they came back home. They often are withdrawn about their memories and may become restless at the end of life. A lot of them are embarrassed about being over there, may have left their friends over there and are struggling internally because they’ve never gotten over that ordeal,” she said. The team works together to listen, understand and provide the individualized care veterans need to find peace. “I’ve learned from other nurses and leadership who help me identify what cues to look for and understand the reasons why veterans may be feeling what they’re feeling. I’ve also learned from some personal experience. We have one-on-one care and treatment plans with them. If we notice any issues that come up, we contact our team as resources for care. Sometimes we use our social workers and counselors and our spiritual care coordinators come into play as well, especially with Vietnam veterans. Caring for one dying father and his family in need especially touched her heart. 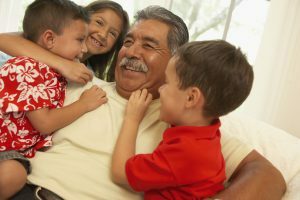 “A couple of years ago I was caring for a patient in his home for a few days and some family dynamics were going on. He was dying and had some unresolved issues with his daughter. We brought in Terri Petersen, one of our organization’s spiritual care coordinators. She was wonderful. They were so thankful that they were able to make amends. The wife called and was very appreciative. Other family came in from out of town and the next morning he passed. Everybody was so happy we had made this a healing process for that family,” she explained. Through her work and own personal experience with hospice, she hopes more people will learn about hospice and its value. “A lot of people still don’t understand what we do and when they hear hospice or crisis care they think death and are afraid of it. We have pain management, medication education and many resources available to the community. We had hospice care for my grandmother and it was a relief. My grandmother was very comfortable, my family was very pleased with our services and I was proud to say I worked for our organization. I feel that hospice should be all over the world,” Pompey said. Call us at (727) 467-7423 any time, day or night, or contact us on our website to learn more about the help we can provide you and your family.